Like just about everything else, motor oil has a lifespan. Even the best oils eventually require you to change them. Historically, many motorists like the convenience of changing oil with the seasons, visiting the quick lube or pulling the ramps out of their garage each spring and fall. Motor oil can deteriorate by becoming contaminated, the additives depleting over time or both. Base oils are the backbone of the finished lubricant that ends up in your engine. They can be conventional, synthetic or a combination thereof. They’re responsible for lubricating components, which reduces friction and protects against wear. Base oils can lose their effectiveness over time due to a few different factors. Oxidation – The interaction between oxygen molecules and motor oil molecules naturally leads to chemical breakdown. Just as oxygen causes a cut apple to brown or exposed metal to rust, it breaks down base oils and reduces motor oil’s effectiveness. Oxidation can lead to increased oil viscosity, which negatively affects energy efficiency. It also causes the formation of harmful deposits and sludge. High heat – Today’s engines run hotter than ever before, with temperatures up to 235°F, and even higher if towing or hauling. The rate of oxidation for oil doubles for every 18°F increase in temperature. Moisture – Your vehicle is also subjected to temperature swings, even when it is parked in the garage. Those temperature swings cause condensation to form inside your engine, leading to water contamination. Leaving a vehicle parked for extended periods or taking short trips that don’t allow the engine to fully warm up allow water to remain in the oil rather than evaporating and exiting through the tailpipe. Water can lead to formation of sludge. This is a BIG problem in northern climates and cars in storage for more than a couple months. Especially when you go out to start and warm it up and it doesn’t get driven to beyond 190F water temps for 15 minutes minimum. Viscosity loss – A lubricant’s viscosity is its most important property. Viscosity has a direct bearing on wear protection, and your engine is designed to operate best using a motor oil of a specific viscosity (e.g. 5W-30). The intense pressure the oil bears as it’s squeezed between moving parts, like the piston ring/cylinder wall interface, can tear apart, or shear, its molecular structure, leading to viscosity loss. Suddenly, the 5W-30 motor oil your engine was designed to use is now essentially a 5W-20 oil, and wear protection may be compromised. Fuel dilution – Fuel can wash past the piston rings and contaminate the motor oil, causing it to lose viscosity. Frequent short trips that don’t allow the oil to reach normal operating temperature can be especially problematic because the fuel won’t volatilize and exit through the PCV system. Excessive fuel dilution leads to sludge and varnish, requiring the oil to be changed more often. Additives are added to base oils to reduce destructive processes and enhance beneficial properties. For example, antioxidant additives help slow the rate of oxidation. Detergency additives help prevent deposits and sludge while cleaning pre-existing deposits. Anti-wear additives are added to some lubricants to form a sacrificial barrier on metal components and help prevent wear. 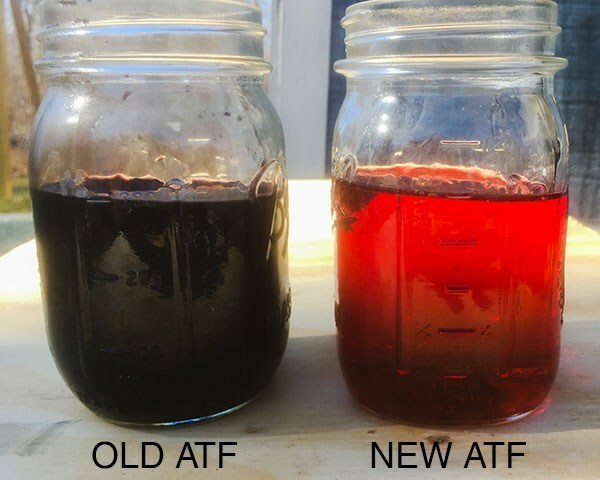 Since they’re sacrificial in nature, additive depletion is one of the primary reasons motor oil loses its effectiveness and must be changed. 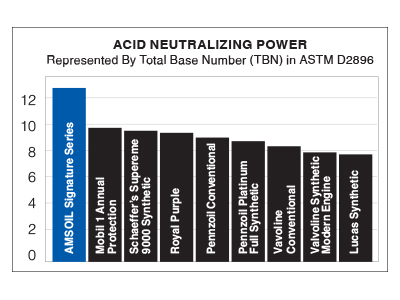 Though all motor oils eventually deteriorate, 100% synthetic oils last longer than conventional oils (often now called Fully Synthetic (or I call fully pathetic), and deliver improved protection against wear and deposits. They’re formulated with base oils that are more resilient to oxidation and heat, while their additives also typically offer improved performance. In fact, AMSOIL Signature Series Synthetic Motor Oil performs so well you can go up to 25,000 miles/one year between oil changes (15,000 miles/one year in severe service) if you want, saving money.